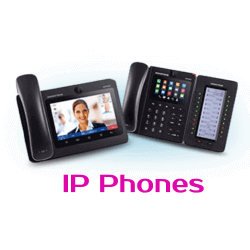 The system can use with Grandstream ip phones as well as other popular sip ip phones from popular brands like Cisco,Polycom, Snom, Dlink , Yealink & RTX. Grandstream UCM6102 use Internet protocols and transmit your calls.Also you have the advantage to use the analog phones when used with Grandstream Gateway.It is a reliable phone system that enables you to handle various tasks and deliver high-quality services at an affordable rate. The entire configuration of this telephone system can be done threw web portal. With the help of advance features supported by grandstream pbx, you can easily customize the this telephone system as your business wanted. You can get the advantage of auto provisioning and set it to your phones without any hassle. It is compatible to your Cisco, Snom, Yealink, Astra, Polycom. and Grandstream IP Phones. If you are not happy with your current communications system, it will be a better choice to choose Grandstream UCM6102 IP PBX. The Grandstream UCM6102 IP PBX works as a base of VoIP system because it can handle IP phones, video phones, and gateways. An advanced line of sip supported IP cameras is available for the security integration with telephony. If you are a plug and play kind of a person, then UCM6102 IP PBX is an ultimate choice for you. If you are a little bit techie, then configure various options with the help of user-friendly panel and enjoy its advanced functions. It efficiently handles the communication needs of your small and medium business organization. There is no need to worry about its efficiency because this IP PBX handle call efficiently even in the times of the heavy volume of calls.